My guest today is Neil Brown a licensed clinical social worker, author, and podcaster. He is located in the beautiful area of Santa Cruz, CA. Neil has over 40 years of clinical experience, comes from a systemic approach and works with families and couples and kids of every age. 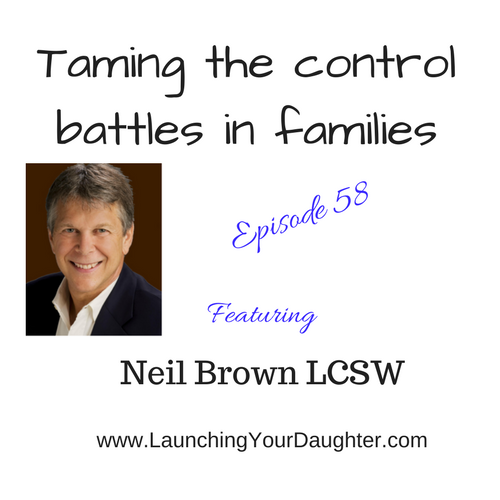 In today’s episode, we are going to explore some areas in his recent book called Ending the Parent-Teen Control Battle. His book is written for parents of middle to high school age teens. What is a control battle? What are the developmental stages in adolescents? He shares how this book began as a presentation, had some roadblocks and continued to persevere his dream. Sign up for newsletter in supporting your teen, parenting tips and more! The information contained in this website including all pages within are for information purposes only and may change at any time without notice. The information within this site is not intended nor should be taken as therapeutic, legal, or otherwise professional or personal advice. Use of this site and/or communication through this site at no time forms a therapeutic relationship between the site user and therapist.